The red dots represent the electrons. The color of the capacitor is yellow (red+green) to represent neutral charge. 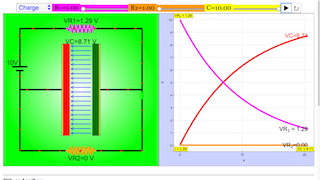 When electron enter one side of the capacitor, color for part of the region turn into red. Another side of the capacitor lack of electron so it color turn into green. You can charge the capacitor or discharge it. Toggling the display combo box will toggle the respective displays. Toggling the sliders were adjust the respective resistors and charge.